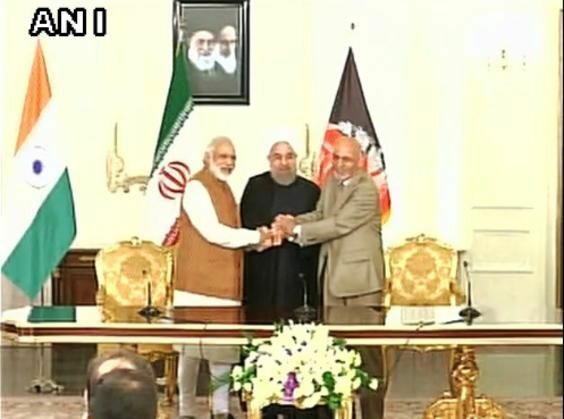 Prime Minister Narendra Modi, who is on his two-day visit to Iran, signed the historic India-Afghanistan-Iran sign land transit trade pact on 23 May. While addressing the conference in Iran, PM Modi said that the three-nation pact will strengthen our ability to stand in mutual support against those whose only motto is to maim and kill innocents. The Prime Minister said, "To carve out new routes of peace and prosperity is our common goal. We want to link with the world. In flow of capital and technology can lead to new industrial infrastructure in chabahar." Modi also informed that after the agreement, Afghanistan will get an assured, effective and a more friendly route to trade with the rest of the world and that the corridor would urge uninterrupted flow of commerce throughout the region. Modi's Iran visit also witnessed the signing of the Chabahar port pact. "The bilateral agreement to develop the Chabahar port and related infrastructure, and availability of about $500 million from India for this purpose, is an important milestone, The Financial Express quoted Modi as saying. He affirmed that the Agreement on the establishment of a Trilateral Transport & Transit Corridor could change the course of history of Iran, Afghanistan, and India.